THE FINAL STEP of Triumph’s two-year journey to supply a Moto2 engine for the 2019 season has been taken and the finished result will make its debut in official testing at Jerez from 23-25 November. 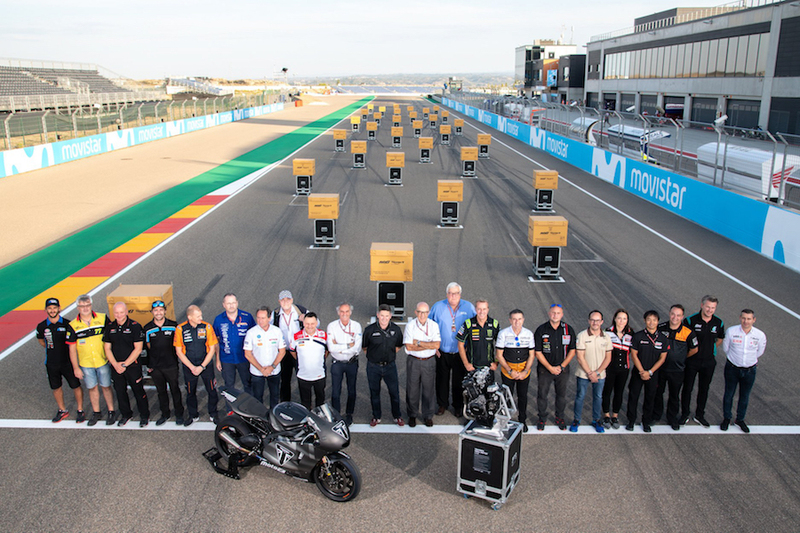 Triumph officially handed over its Moto2 765cc triple engine to Dorna CEO Carmelo Ezpeleta at the recent Aragon MotoGP. Based on the Street Triple RS engine, it has been supertuned with a modified cylinder head, titanium valves, race alternator, taller first gear, adjustable slipper clutch, race ECU and new engine covers and sump housing to minimise overall engine size. This work has been undertaken by a team of Triumph specialists, joined by representatives from Dorna, Externpro and Magneti Marelli, and helped by rider input from several former Moto2 and British SuperSports competitors. Now it is up to the Moto2 teams to find the best chassis to house the new control engine. This new era of Moto2 will bring a unique sound to a series that has until now been powered by 600cc in-line four-cylinder Honda engines. It will hark back to the days of the late 1960s and early 1970s when MV Agusta ran three- cylinder engines in Grand Prix racing while Triumph ran its own triple in some of the world’s most famous races, including the Daytona 200 and Isle of Man TT. MV Agusta rejoins GP racing next season, with a Triumph engine in its own frame.